Farmers are usually very familiar with diarrhoea caused by bacteria such as E. Coli, or viruses such as rota or corona viruses. Conversely, parasitic infections like cryptosporidiosis are less well known. In practice, diarrhoea is one of the leading causes of death in calves. It is also one of the most important causes of financial loss. Reason enough to prevent calf diarrhoea caused by Cryptosporidium Parvum and to actively tackle problems that occur. But what is Cryptosporidium Parvum? How does cryptosporidiosis cause diarrhoea? What are the symptoms? And more importantly, how can farmers prevent and treat cryptosporidiosis? This article, which contains input from vets, goes into more detail. How does Cryptosporidium Parvum cause diarrhoea? Cryptosporidium Parvum is a unicellular intestinal parasite. A parasite is an organism that lives and reproduces at the expense of another living organism. Cryptosporidium Parvum can cause diarrhoea in calves between the ages of 5 and 21 days. Diarrhoea means watery, loose stools that occur more frequently than three times a day. Cows excrete the developed eggs of the Cryptosporidium Parvum parasite via their faeces. These little eggs are also known as oocysts. Calves can become infected with Cryptosporidium Parvum by ingesting oocysts in faeces. In addition, they can be infected indirectly through surface water and feed such as milk. Sporozoites from the oocysts are released in the small intestine and latch on to the epithelial cells of the gastrointestinal tract, thus damaging the cell surface. The damaged cell surface causes increased gut permeability and disrupts the transportation of nutrients. The intestinal mucosa actively discharges water and exudate, which causes thin faeces, i.e. diarrhoea. A proportion of the oocysts leaves the body via the faeces. The rest remains in the body and re-infects the calf. Calves infected with the Cryptosporidium Parvum parasite do not always appear sick. That is why Cryptosporidium Parvum is also known as the silent killer. Some animals that have had the disease still excrete the parasites, but are no longer sick. The first symptoms that present in calves suffering from the parasite are lethargy and poor appetite. In addition, calves discharge yellow-green, semi-liquid diarrhoea. This may sometimes also contain blood. The diarrhoea dehydrates the calves and causes them to lose weight. The diarrhoea persists for a few days and the calf may develop a mild fever. However, the symptoms are not unique to cryptosporidiosis, which makes it difficult to distinguish the Cryptosporidium Parvum parasite from other causes of diarrhoea. Besides, half of infections involve a combination of viral diarrhoea and feed-related diarrhoea. Treatment of the calves can be started once a vet has diagnosed Cryptosporidium Parvum. However, this is not simple. The oocysts of the Cryptosporidium Parvum parasite have strong cell walls. They are therefore very resistant to all kinds of external influences. Therapeutic options to treat cryptosporidiosis are limited and vaccination of dry cows at the end of gestation to increase antibodies in colostrum has no effect. However, there are products on the market that inhibit the growth of the parasite. The effects of diarrhoea caused by the parasite can be treated, however. Dehydration is the leading cause of death from diarrhoea. This is because diarrhoea causes the calf to lose a great deal of fluid and electrolytes. Supplementary feed such as Denkacare Vitalfort supports the electrolyte and acid base balance. Denkacare Vitalin is an effective means of thickening the faeces, combined with support of the electrolyte and acid base balance. Because the Cryptosporidium Parvum parasite cannot be treated directly, it is important to prevent infection with Cryptosporidium Parvum. Apart from the fact calves can be infected with Cryptosporidium Parvum at birth, infection with Cryptosporidium Parvum is also caused by environmental factors. Hygiene therefore plays an important role in preventing infection with Cryptosporidium Parvum. Good hygiene starts at birth. The calving unit must be clean with dry straw. If the cow needs assistance giving birth, ensure the materials used have been disinfected. Do not forget that personal hygiene such as clean workwear and disinfected hands are also important. Ensure the calf is placed in a clean environment quickly and disinfect the navel to reduce the risk of infection through the cow’s manure as much as possible. 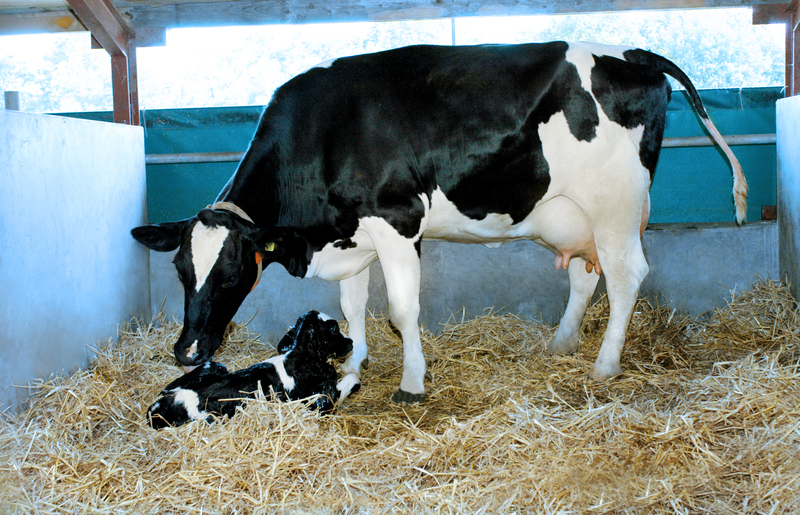 The new-born calf needs individual accommodation in a clean, dry environment. The igloos or individual cubicles in which calves are placed should be left empty for a while after cleaning before being used for another calf. That reduces the risk of infection. Housing calves individually for the first few weeks reduces the risk of infection from other calves. The calf should also be monitored closely. During the first weeks of the calf’s life, its resistance to disease is not yet fully developed, which makes it easy prey for parasites. A sufficient amount of high-quality colostrum ensures the calf is more resistant to the parasite. In addition, sufficient colostrum ensures a high level of immunity so there is less chance of diseases. For farmers, the short-term consequences of Cryptosporidium Parvum in calves are extra labour, extra costs because of medical treatment, and potential high mortality. In the case of a diarrhoea outbreak caused by Cryptosporidium Parvum, these costs can vary between €15 and €58 per calf. In the long term, diarrhoea caused by infection with Cryptosporidium can additionally hamper development in heifers. Heifers may have their first calving later and be lagging in development. Well-developed heifers will be more productive than poorly developed heifers. All the more reason to prevent these adverse effects and tackle Cryptosporidium Parvum preventively by investing in proper housing and hygiene. Consult your vet for diagnosis and treatment of Cryptosporidium Parvum.